Borderlinx | Buy Best Buy and ship worldwide with Borderlinx. Cheap rates guaranteed. Technology has limitless capabilities to offer, and Best Buy USA can help bring it all right to you. For over half a century, Best Buy USA has offered consumers only the latest, most powerful technology available. From smartphones, to computers, to home theater systems, to GPS and navigation tech, and even musical instruments, Best Buy USA products can take your home, your car, and your life to places you've only imagined. Whether you're seeking to boost pure entertainment, professional productivity, or schoolwork potential, there's something to discover at Best Buy USA. With a large selection of devices and brands available, Best Buy USA technology is a perfect one-stop-shop for your tech needs. Aside from the many product offers, Best Buy USA also provides a number of services such as device repair, recycling, troubleshooting, and more through the Best Buy USA Geek Squad. With regular sales, refurbished devices, clearance events, it's easy to find both amazing and affordable technology. Consumers who shop Best Buy USA items can feel good knowing they are supporting organizations sponsored by the company, such as Boys and Girls Clubs of America, MOUSE, and more. 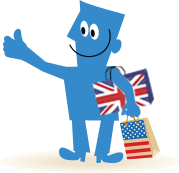 Now, customers across the globe can buy Best Buy in the USA and ship worldwide with Borderlinx! After determining cheap shipping, tax & duties upfront using our shipping cost calculator, Borderlinx will ship your order to your home country. A number of services are available through Borderlinx to make international ordering from Best Buy USA hassle-free, including concierge, free repacking and consolidation services.